Pretty good what there is of it, plenty of it for what it is. 599598 If you aren't familiar with the Mornin' Mail, ya must not be from these parts. Get some email to us and we'll try ta let the folks here in Carthage, Mo and SW Missouri who's watchin'. Thanks for callin'. This is some fact, but mostly, Just Jake Talkin'. <Be sure to bookmark our page. Email your comments or opinions. No religious, abortion, or capital punishment opinions will be published. Jasper County Courthouse located on the Square in Carthage. 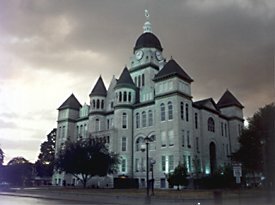 Construction was completed in 1895 and the "Temple of Justice" is still serving citizens on a daily basis.